Parallels Client Setup Wizard Ended Prematurely. 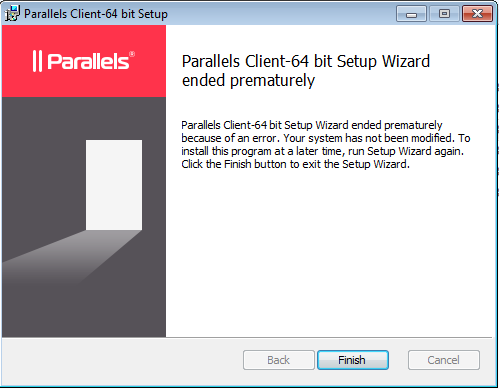 Parallels Client-64 bit Setup Wizard ended prematurely because of an error. Your system has not been modified. To install this program at a later time, run Setup Wizard again. Command Prompt executable file (cmd.exe) is either missing in C:\Windows\System32 folder or was renamed thus Parallels Client installation wizard can not use it for installation of the application. Make sure that cmd.exe file is presented in C:\Windows\System32 folder. If Command Prompt executable file was renamed please name it cmd.exe and then re-run Parallels Client installation.